What is the in-universe cost of an AT-AT? 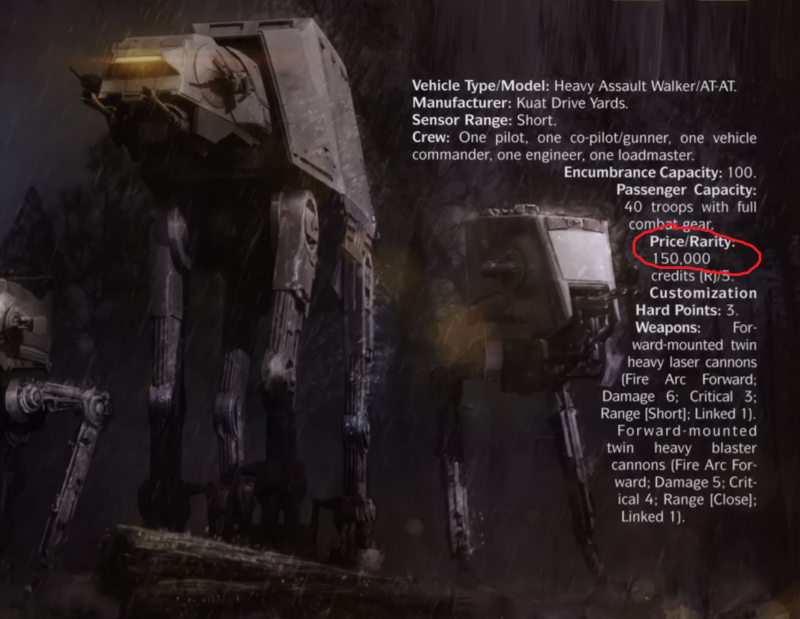 I need to know how many credits an AT-AT costs? I've searched but I can't find any resources or materials that tell me how much it costs. The Age of Rebellion Core Rulebook identifies the nominal purchase price of an AT-AT as (approx) 150,000 Imperial credits. Given that they're described in other rulebooks as being non-available to anyone outside the Imperial Military, I would argue that they're not really purchasable openly, regardless of the size of your pocket-book and even as military surplus. You'd either have to get one on the black market or pay someone to steal one. How many credits (Republic credits or whatever) does a Death Star cost? Did George Lucas base Darth Vader on Lightning from The Fighting Devil Dogs? How are Star Wars blasters properly reloaded/charged/etc.? Has Yoda ever killed a Sith Lord or Dark Jedi Master and, if so, who? How easy is it to build superweapons? What was Count Dooku's first name? How much did the first batch of 20,000 clones cost the republic? How much does it cost to refuel the Millennium Falcon? Does anyone besides Qui-Gon refer to credits as “dataries”? What is the in-universe cost of a TIE fighter?